Area code 907 was put into service. Aleutians East County, Aleutians West County, Anchorage County, Bethel County, Bristol Bay County, Denali County, Dillingham County, Fairbanks North Star County, Haines County, Juneau County, Kenai Peninsula County, Ketchikan Gateway County, Kodiak Island County, Lake and Peninsula County, Matanuska Susitna County, Nome County, North Slope County, Northwest Arctic County, Prince Wales Ketchikan County, Sitka County, Skagway Hoonah Angoon County, Southeast Fairbanks County, Valdez Cordova County, Wade Hampton County, Wrangell Petersburg County, Yakutat County, and Yukon Koyukuk County. Area code 907 serves the larger communities of Anchorage, College, Fairbanks, Juneau, Ketchikan, and Sitka in addition to many smaller communities within the area code 907 service area. 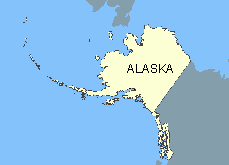 The Alaskan community of Hyder is an exception and uses area code 250 which is assigned to British Columbia.